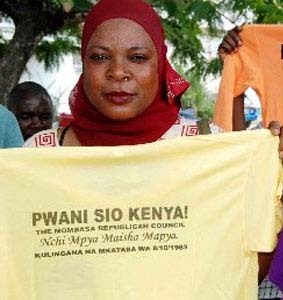 The Azanian Sea: The Mombasa Republican Council: Separatist Extremists or Legitimate Protestors? 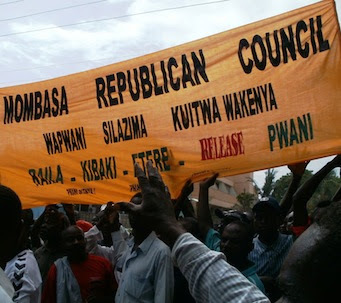 The Mombasa Republican Council: Separatist Extremists or Legitimate Protestors? As I stepped out into the steamy humid Mombasa dawn, into a waiting taxi at Mombasa International Airport, I wasn't thinking about politics, or religion for that matter. But with a name like Prophet, my driver seemed destined to deliver a particular message. As we drove through the Mombasa morning, the acrid smell of burning trash piercing my nostrils, he shared some definite ideas about Mombasa's political situation. Apropos of nothing, he began speaking about the Mombasa Republican Council, a group of "extremists" who "were trying to destroy Kenya." 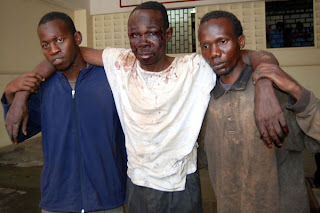 They had, according to him, repeatedly said "they were not part of Kenya, until President Kibaki had no choice but "to go in there and start busting some heads" to "teach them a lesson." I asked my driver how long this was. "2 months ago, after they were banned." I was fascinated by this rather pointed condemnation. I had been unaware of the recent rise to prominence and notoriety of the MRC, and I resolved to find out more in my short trip. I started with Paul Goldsmith's ominous sounding MRC Conflict Assessment Report. The report is an excellent place to begin contextualizing the history of the Kenya Coast and the tangled threads that led to the present situation. The MRC issue is also heating up just as the country begans its long breath-holding leading up to the important March 2013 elections. Back up a little for a brief review of history. The coast of Kenya has always had a different sense of historical identity than the rest of Kenya, and was treated as such by the British. Since the 1800s parts of it had been ruled by various Omani families. In the mid-nineteenth century, the Busaidi royal family under Said bin Sultan brought it under the control of the Sultanate of Zanzibar. In 1888, the 10 mile strip of coast was leased to the Imperial British East Africa Company. In 1895, in an agreement between the Sultan and the British Crown, the coast becoming a Protectorate as the Sultanate of Zanzibar was, while the rest of Kenya became a colony. In the early 1900s, British interests shifted inland, and they shifted their colonial capital to Nairobi. Thus from the beginning of the British colonial project, seperate administrative regimes characterized coast and interior. As Kenyan independence approached, the status of the coast again became an issue. For various reasons, the Coast lagged behind other areas of Kenya in development and education. At least part of the reason was due to the reluctance of Muslims to send their children to colonial or missionary schools. So while a generation of upcountry people took advantage of educational opportunities under the colonial system, coastal people were bypassed. Upcountry people moved down to the coast to take advantage of job opportunities, changing the demographics of the coastal towns. Coastal residents worried about the disposition of their lands. Swahili and Arab townsmen, fearing loss of representation and privilege, formed political parties to advocate for the rights of coastal people. The various parties can be grouped under a general "movement" called Mwambao, which called for autonomy and sovereignty for the Coast, or for its unification with Zanzibar. But Mombasa's economic importance to the rest of Kenya made this political outcome highly unlikely. In late 1961, the Robertson Commission recommended that the Coast be joined to mainland Kenya before independence. In response, On December 17, 1961, Mijikenda leader Ronald Ngala lowered the red flag of the Sultan of Zanzibar at Malindi, a Kenyan coastal town. In the 1960s, Kenya also faced demands from Somalia to cede part of its territory in the northeast. Unlike most post-colonial African states, which were and are divided by ethnicity and language, Somalia faced a situation of internal ethnic and linguistic unity, with a good number of Somalis actually living beyond the colonial borders. But Kenya violently quelled the secessionists, indicating that it would be willing to use force to maintain the territorial integrity of Kenya. The idea of the territorial integrity of colonial boundaries was something that emerged from the more conservative political vision of OAU members, who sought guarantees that what they viewed as "radical" Pan-African activism of states like Ghana would not affect their own bases of power. It is well known that the Kenyan president throughout the state's recent history possessed final say over the disposition of land on the coast. President Kenyatta in particular used coastal land to reward independence fighters and other supporters, at the expense of locals. Thousands of acres of land were declared state property and made a patrimony of the former president, a tool of political patronage. This is well known even by upcountry people residing on the Coast. Despite the Coast being one of Kenya's top tourist destinations, and a base for the ever popular safaris to the major game parks, the local people have not enjoyed the economic benefits of tourism. Tourism dollars have not translated into substantial advances in education and development, and in fact have only eroded coastal people's control over the land. Far more upcountry people work in the tourist industry on the coast--as guides, drivers, cooks, builders, and souvenir sellers--than do coastal people. The MRC has been around in one form or another since the late 1990s. The MRC's cry of "Pwani sio Kenya" is indicative of this tangled history and intense grievances. But it is also a strategy to get themselves heard, albeit a non-starting strategy in the eyes of most Kenyans. The MRC claims to possess documents separate 50-year lease agreement signed by Kenyan Prime Minister Jomo Kenyatta and his Zanzibar counterpart Mohamed Shante in which the Kenyan coastal strip is integrated into Kenya. The MRC claims that this lease expires next year, when the coastal strip should ‘regain’ its independence.The group has been banned and unbanned various times over the past few years, its leaders have been beaten by police, imprisoned and arrested, and generally treated as an extremely dangerous threat by other Kenyan leaders. MRC supporters, unlike most Kenyans, have greeted the new 2012 Constitution with cynicism, arguing that it doesn't reflect their interests. There is a deep-seated well of frusturation on the Coast that secessionist sentiments play into. Not all coastal people support secession, but any coastal person with some familiarity with the situation is aware of the pressing need for change that will empower coastal residents. Does the MRC have links to militas like al-Shabaab or more militant transnational groups like al-Qaeda? 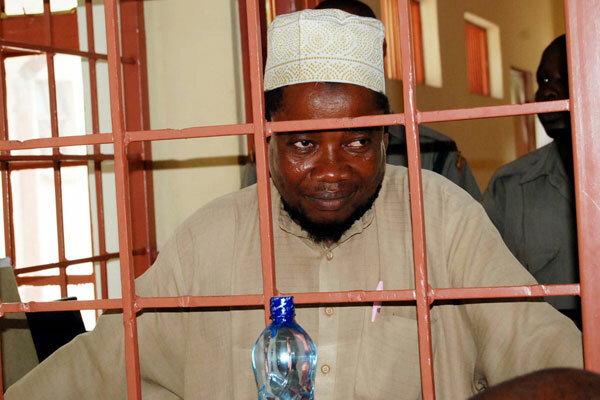 The evidence for such links is extremely tenuous, although upcountry Kenyans often link the seperatists with al-Shabaab, mostly because (I think) their idea of the threat of Islamic militancy is primarily represented through the symbol of that specter in modern day Kenya (also connected with Kenya's brief incursion into Somalia during Operation Linda Nchi). MRC is frequently linked to Uamsho, another separatist oriented group in Zanzibar, although it seems Uamsho has a much clearer social agenda related to the "Islamization" of Zanzibar island, than does the MRC, which is far from being a Muslim-only group. As the many media commentators have observed, the common thread linking these movements are social problems like unemployment, poverty and economic and social marginalization. Despite the tremendous wealth entering Coast Province through tourism and trade, coastal residents have benefited little from development projects mainly designed to serve foreign tourists. I saw concrete evidence of this driving through the countryside south of Malindi, where mile after mile of coastal resorts with Italian names were in various stages of construction, while people live in abject poverty sometimes only a few hundred yards away. What provokes most anxiety in ordinary upcountry Kenyans who live on the coast, many of whom are struggling to make a living just as much as the Swahili and other indigenous coastal groups, is xenophobic, anti-Christian, anti-mainlander/upcountry undercurrent to the MRC protests. It fuels irrational fears by these Christian coastal residents of Muslim dominance or foreign, Arab control of Kenya. The sad reality is that the Kenyan economy is already controlled by foreigners. Its economy is dependent on foreign aid and tourism, a fact which I believe will play some significant role in the upcoming election. Kenya's dependence on the West means that the election of Kenyatta and Ruto would throw its economy and political situation into further disarray, given their situation at the ICC. But that is another story. Analysts urge Kenyan leaders to address the grievances (if not the demand for secession) of MRC while remaining alert that it does not develop into an armed rebel group. In the 2007-08 election violence, elites often armed youth brigades to commit destabilizing acts of violence. Youth sympathetic to the MRC could very well be drawn into post-election violence. In my opinion 1) the coast will not cease to be a part of Kenya because Kenyan elites will not allow it 2) MRC can succeed in demands for autonomy and development if they moderate their secessionist stance while retaining the unity of their base 3)In addition to development projects and education for coastal residents, some sort of cultural program of understanding should be put into place to develop deeper ties of mutual understanding between coastal and upcountry communities. For more on mwambao, see James Brennan, "Lowering the Sultan's Flag: Sovereignty and Decolonization in Coastal Kenya." Comparative Studies in Society and History 2008: 50(4), 831-861.